Long spear with a very long red hilt. Traditionally used by groups of soldiers. Specially designed for long distance thrusting. Spears are precise long-range weapons that are used for thrusting attacks. They allow attacks while holding a shield up to guard, providing simultaneous offense and defense. Spears do not do well against a shield. They glance off the shield and do not stagger shielded enemies as easily as other weapon attack types. Despite what the item description says, the Pike does not have the longest range of non-projectile weapons. 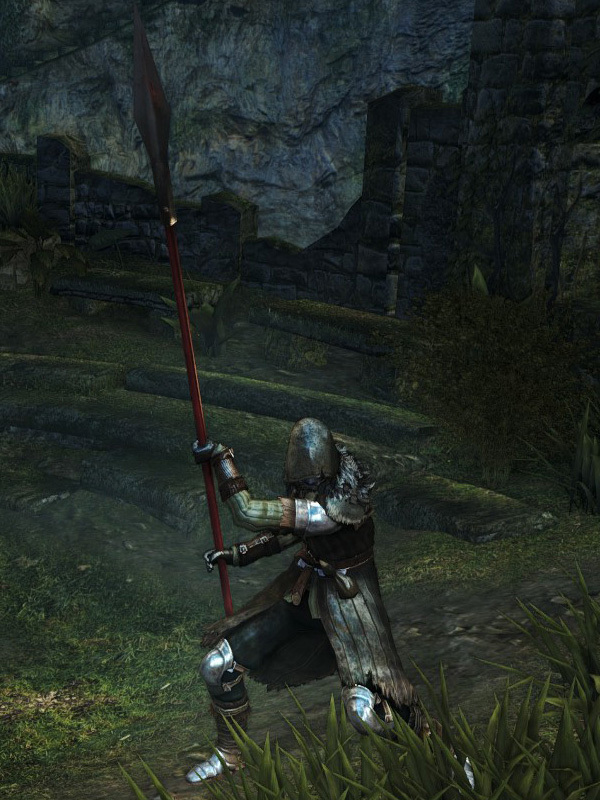 The Silver Knight Spear, Dragonslayer Spear, Moonlight Butterfly Horn, and Demon's Spear are all longer. On rare occasions the pike may "Launch" an enemy with its two-handed rolling attack. So far this has only happened on a killing blow. Charging thrust attacks (backstep/run + R1) will carry the character over a long distance, hence can potentially cause falling off edges. Pike durability reduced to 18. Base damage increased. Cannot repair weapon (except through reinforcement).